I always read and consider customer reviews before making online purchases. It kind of makes you wonder if any of them are real, eh? 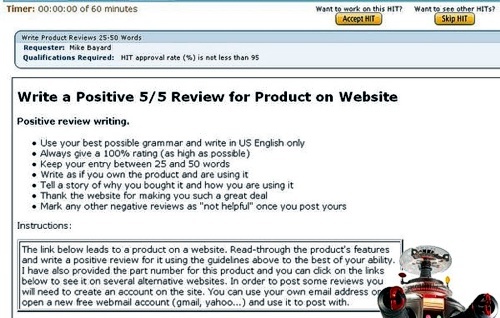 Remember how Michael Bayard, a Belkin Business Development representative, was apparently hiring people from Mechanical Turk to post glowing reviews of Belkin products on Amazon and elsewhere? Well, we just received an apologetic letter tucked firmly between the quaking legs of Mark Reynoso, President of Belkin -- a man clearly fearful of a consumer backlash. Reynoso expressed "surprise and dismay" that one of his employees "may have" (er hem, may have?) invited positive reviews for payment. You can read Belkin's Letter from the President by clicking on the link. Yahoo Widgets: Coming Soon to a TV Near You! Europe Formally Charges Microsoft with Monopoly... Again.